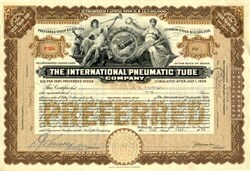 Beautifully engraved certificate from the International Pneumatic Tube Company issued in 1920. This historic document was printed by the American Banknote Company and has an ornate border around it with a vignette of two allegorical woman, one holding a trumpet and sword, the other a laurel wreath and a plant, with an image of a pnuematic tube in the center. This item is hand signed by the company�s president and acting treasurer and is over 91 years old. Pnuematic Tube systems were primarily used to transfer documents within buildings. Networks of pneumatic tubes began to carry mail along under city streets in the 1890s. Pneumatic tube carriers could hold up to 600 letters and travel 35 miles per hour. The first pneumatic tubes were introduced in 1893 in Philadelphia. Boston, Brooklyn, New York, Chicago, and St. Louis soon adopted the system. Pneumatic tubes lost their usefulness when they became too expensive to maintain and expand. It cost too much to expand and move the system to keep pace with the movement of cities' ever-changing business centers. Pneumatic tubes were introduced by the post office to deliver mail in large urban areas. The system used pressurized air to move a mail canister through an underground eight-inch cast-iron pipe. At its greatest expansion, there were more than 56 miles of mail tubes on the East Coast delivering as many as 200,000 letters per tube every hour. (Legend has it that a live cat was sent through as a test in 1896.) Western Union also used pneumatic tubes, linking its main telegraph office to some of the exchanges. When the system was first installed, pneumatic transport was considerably faster than horse- drawn wagon, then the most common vehicle for mail delivery. In New York City, two pipes were used along each route, one for sending, the other for receiving. The pipes were buried 4 to 12 feet underground, though in some places the tubes were placed within subway tunnels, parallel to the 4, 5 and 6 lines. Each container was labeled to indicate the destination of its contents. Special delivery letters were delivered within one hour; regular letters within three. Construction of the tubes began in the late 1890's and they were in operation by 1898. Before the end of the original 10-year contract, the pneumatic service was taken over by the American Pneumatic Service Company, which later became the New York Mail & Newspaper Transportation Company. Charles Emory Smith, the former postmaster general, predicted in The Brooklyn Eagle in 1900 that one day every household would be linked to every other by means of pneumatic tubes. Around the turn of the century, there were even several proposals to build a system between North America and Europe.